This is a picture from the 2005 World Championship finals in Foxboro, Mass. These are all the people that were on staff or in the corps this last season who were members my first year with the Boston Crusaders in 1999. They are all very special people and have impacted the drum corps incredibly, each and every year I have been at Boston. I love them all very much and truly cannot thank them enough. Thanks Howard! We're running out of Forzatos! 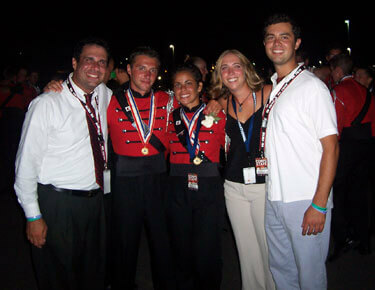 E-mail your best drum corps shots to forzato@dci.org along with a description of where and when the photo was taken. Send some biographical information about yourself as well. We'll give you full credit.